Yup I'm repurposing more jewelry... I've been wearing my heart choker a ton these days and getting a bunch of compliments. Love that I took some icky earrings and made a beautiful choker. So exciting! And now I find myself wanting to create my own pieces instead of buying them. 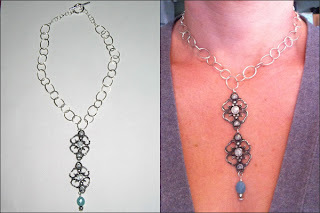 Or repurposing items to make my own jewelry pieces. 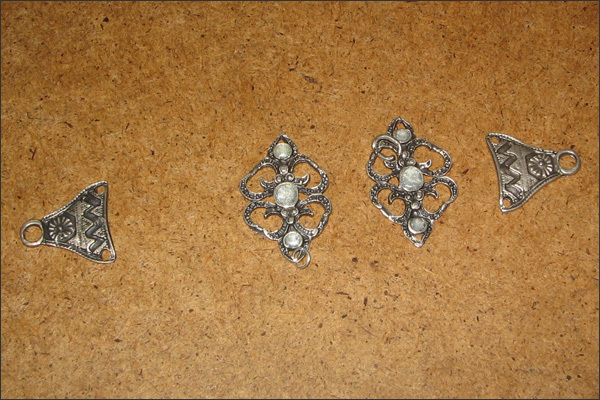 Jewelry project #1 is for an open grey cardigan that I like a lot. I thought a swanky broach would be great for it. I didn't want to make holes and add buttons - definitely would have ruined it. 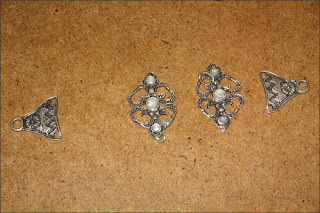 So was really into finding a broach to use as a way to close the top of the open cardigan. I haven't been able to find anything too lovely that was reasonable. Today I dropped by Button Button to check out button options. 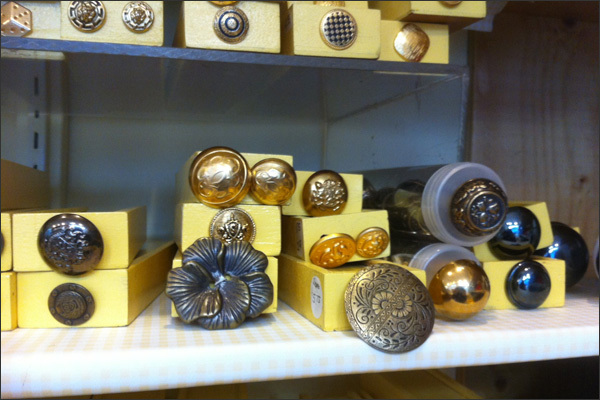 I thought I could glue a bar pin to the back and convert the button into a broach. Easy peasy and probably a pretty reasonable creation. 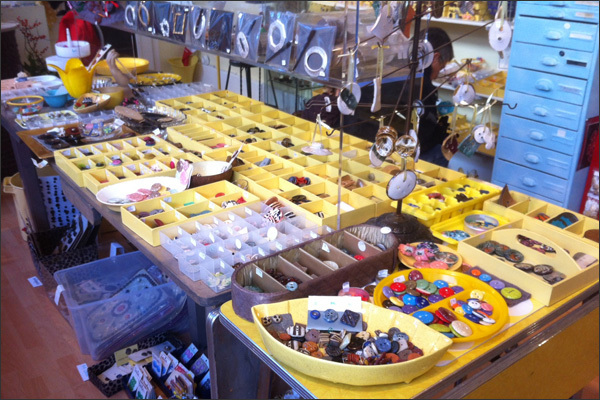 Now Button Button is a small store with TONS of stuff... Very overwhelming to be honest. 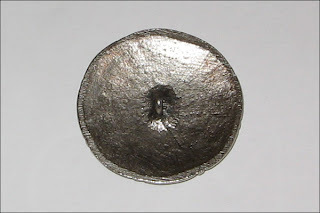 I wanted a silver button, pretty big and elegant... Something I knew would fit with my other jewelry and that I wouldn't get tired of. This is what I ended up buying for $7.75. I have this 'thing' for decorative designs... Kind of girlie. 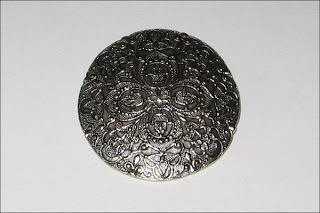 It's a pewter antique button reproduction. You find the darndest things in Button Button! I'll glue the bar pin to the back then should be good to go! I would imagine my broach will cost under $10. It'll definitely work for the time being. Maybe I'll find something in a thrift store that's better. We'll see! After Button Button, I hit Collective Stone again. Unfortunately I dismantled the bracelet I repurposed before getting a photo of it! Bad DIY-er... Gesh! Hopefully you can get an idea of what the bracelet looked like below. I bought this bracelet from the Salvation Army for $2.50. Bracelets annoy me for some reason. I tried wearing this piece since it was pretty but I couldn't do it. I decided to repurpose it into a necklace of some sort! I worked with Dominique this time. We looked at chains, brainstormed on ideas and then took apart my bracelet. This is the chain I decided to go with. Here it is... It went through a few variations. I find you go from complicated (basically adding EVERYTHING) and then you remove items to make it simple and clean. I used 2 of the 4 pieces then added a drop stone to it. I thought this would give it some weight and colour... 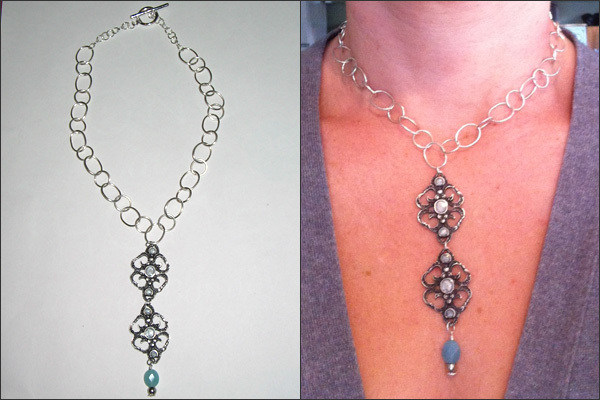 The necklace needed something to jazz it up! 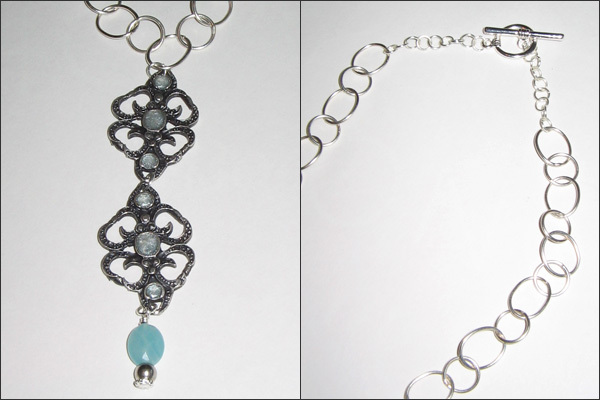 I was going to try to use the bracelet's end pieces for the clasp in the back but they didn't work so we went with the below clasp. 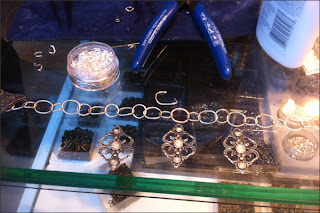 I can always use the remaining pieces for another jewelry project. The necklace cost me under $20 in total - $2.50 for the bracelet then $15 for the supplies from Collective Stone. This weekend I hope to work on my cabinet. 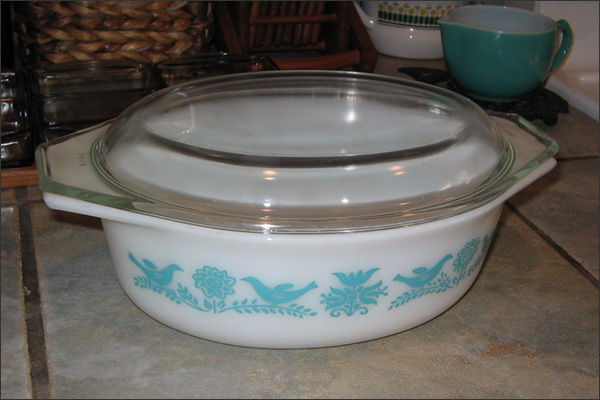 I found this Pyrex dish to go with my collection. Maybe one of the pieces I'll 'feature' in my finished cabinet. I love turquoise... And birds... And flowers. So sweet and it was $5.99. Great find indeed!